He says it’s because many Thai desserts have rich coconut milk as their base, so he grew up believing that coconut milk, which many Thai curries are laden with (which is why I like them), is meant to be eaten for dessert. I suppose it’s like how Thais eat corn for dessert, which I thought was weird at first since I’m used to savory grilled corn on the cob, but I grew to like corn mixed with coconut pieces and sugar. But alas, Dom never has liked coconut based Thai curries, which is why we hardly ever eat Thai curries at our home. But the other day we went to our first ever Thai buffet at Thai House in Austin. We felt like we were at a lunch market in Thailand, but instead of ordering two dishes with rice, we got to choose any dish we wanted and eat as much as we wanted of them. It was heavenly. It was at this restaurant that we got Pad Ped Tua Fak Yao, which translated into American lingo is, Thai Red Curry with Long Green Beans. I barely remembered the dish from Thailand, but Dom told me that it was because it’s usually a banok dish, aka, a “redneck dish” because it’s eaten in the countryside more than in Bangkok. It’s made with a red curry paste, with no coconut milk, and stir-fried with chicken and a long green bean, and so spicy, and flavorful. Dom requested if pretty please I could figure out how to make it. Of course! I couldn’t wait to make a Thai curry that my hubby would actually enjoy! So I did, and it’s sooooo easy. All you do is pop open a container of Thai Red Curry Paste or Nam Phrik Kaeng Ped Curry Paste, which is what I used, mix it with some oil, get it hot, add your meat and green beans, fish sauce and oyster sauce if you want, and you are good to go! You could make your own curry paste of course, but that takes quite some time, having a nice mortar a pestle and having all the fresh ingredients. 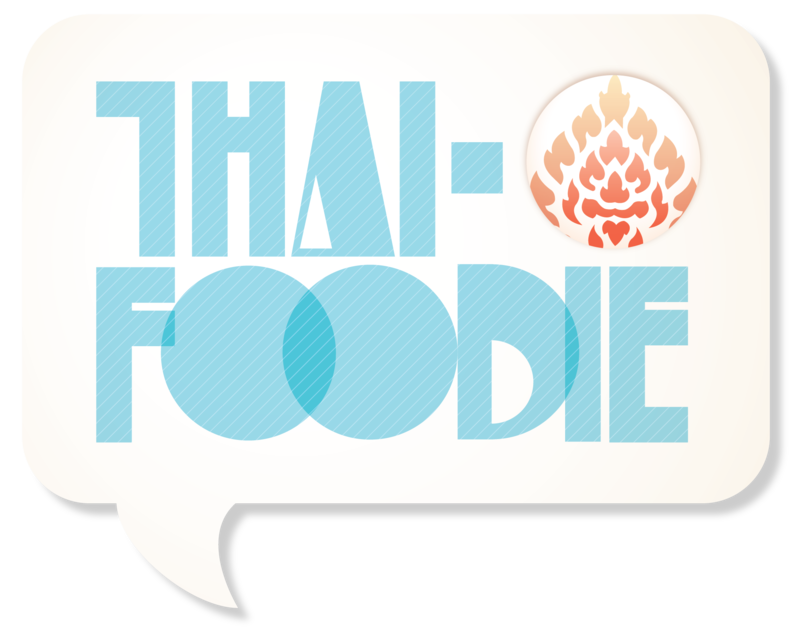 Many Thai chefs say pre-made curry pastes made by Mae Ploy or Mae Anong brands are the best. Try some tonight, and let me know what you think! Looking for a quick Thai curry that's easy to make at home? 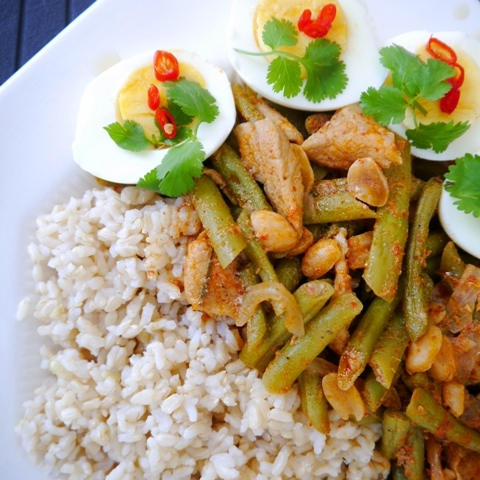 Try our delicious, spicy, flavorful Thai Red Curry Chicken with Green Beans recipe today! Add the oil and curry paste to a hot wok or pan. Keep in mind, the more curry paste you add, the hotter the dish will be. Mix until fragrant, 2-3 minutes. Add in chicken, and a tablespoon or so of the sauces. When chicken begins to change color, add in green beans. Add in water to the preferred sauce consistency you enjoy. Dom likes it with lots of sauce, I don't really care. Add in more oyster sauce, fish sauce and sugar to taste. Cook until chicken is cooked through and beans are tender-crisp. Turn off heat and add in lime leaves, and peanuts. I was going to just buy red curry paste, but then when I got to the Asian store I saw the different varieties and that the picture on the Nam Phrik Kaeng Ped Curry Paste matched the dish that we had eaten, so I used that one. But using Thai Red Curry paste is pretty much the same thing, just another name for it! This sounds delicious! And your presentation in the photograph is amazing – so beautiful. Thanks Ebs! I agree! Dom styled this dish so well and took such great pics of it! 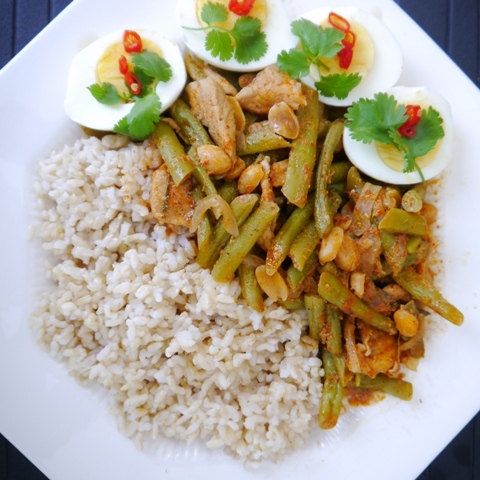 I have tried this dish with the Mae Ploy curry paste and I agree – it is so delicious and easy! Nice post! I’m so glad you enjoy it too Sita! It’s a great quick weeknight meal!